This is a pack of ten 8x16x5mm metal shielded "Speed" 1/8 wheel bearings. ProTek R/C "Speed" bearings are high quality steel/chrome bearings designed for the R/C racing enthusiast. These 8x16x5 metal shielded bearings are the standard bearing for 1/8th scale off-road vehicles, both for internal bearings in the diff cases as well as external wheel bearings. We offer these in metal shielded versions as some racers prefer these over the rubber sealed bearings. Please check the manual that came with your vehicle for the correct size if you are not certain. 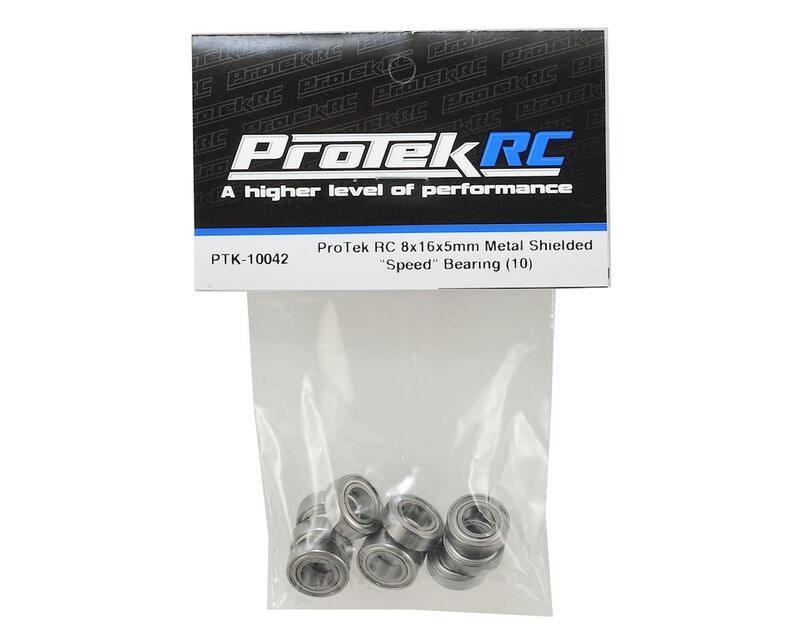 Great price, good Protek 8x16 metal shielded bearings and they last for a long time. These last as long as any other bearings on the market as I have tried all the bigger name brands and even the overpriced ceramic bearings, as I race a lot. These work great in both my MBX6R 1/8 scale nitro and MBX6 Eco, but do realize I do check and possibly change out bearings about every race, but at this price, that is cheap maintenance to replace. 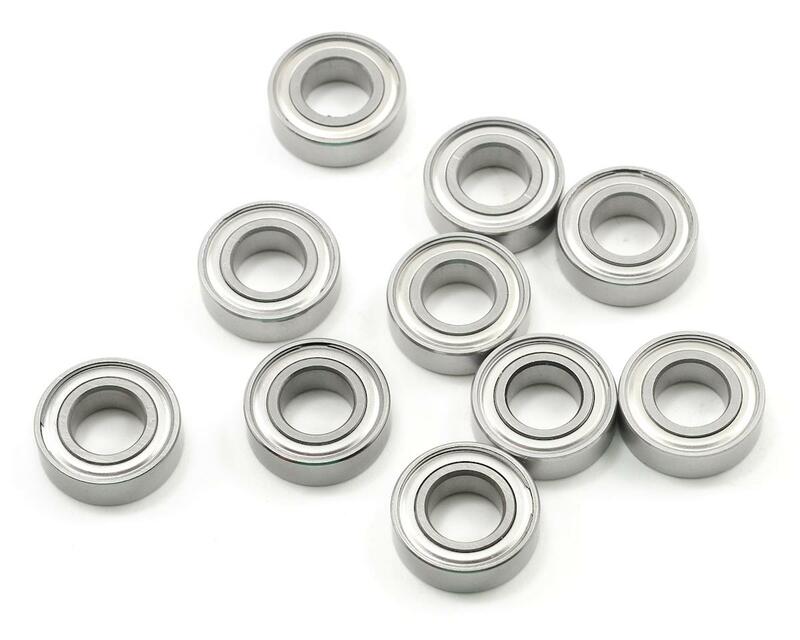 I personally prefer the metal shielded bearings over the rubber shielded as they provide less restriction, but just remember to check them regularly as they do not seal as well as the ProTek rubber shielded bearings. Purchased these as I needed 4 inner bearings to run the universals on my ET48.3. After 2 packs, about 30 minutes on the dirty track I took the truck apart and found that the rear 2 were pretty crunchy already. The stock outer Tekno bearings were still smooth as new. I cleaned and oiled them and put them back in so we will see how they are after another few packs. I was expecting them to keep more dirt out, but I have extras and they are cheap so its no big deal.. Reliable and consistent bearings. They distinct from the way they are sealed. I like the chrome metal shield they are covered. Bearings came well greased and lubricated. Great price vs quantity too! I have it on my MP777 SP2 for two endurance races but still they ran as equal as the first time being installed on my vehicle.